How Much Money Will Trump Collect from Steel Tariffs? On March 8, 2018, US president Donald Trump issued two proclamations to adjust US imports of aluminum and steel from all countries except Canada and Mexico, key regional allies and trade partners. President Trump asserted that a 25 percent tariff on steel “articles” and a 10 percent tariff on aluminum articles are necessary for the US to develop its domestic steel and aluminum industries and to protect and create jobs. The US is the world’s largest importer of the steel and aluminum articles covered by the proclamations. The import value of steel articles has declined twofold in the last two years, yet remains 32 percent greater than in 2009 and double the value in 2003. In contrast, the value of aluminum articles imported during the last three years has been increasing and is now twice the level in 2000 while remaining below the most recent peak in 2006. Canada and Mexico, which are exempted from the tariffs, constitute 32 percent of total US imports of steel and aluminum articles. China accounts for only 8 percent of US imports of the same steel and aluminum articles. According to the Global Trade Alert (GTA), the US implemented 47 percent of harmful interventions in the steel industry in the period since the start of the global financial crisis. China, however, has made more harmful interventions in the aluminum industry — about 5 percent of total events globally — than any other country, according to GTA. The US government will potentially collect $7.4 billion a year from the new tariffs according to the definitions specified in the presidential proclamations and data from the United Nations Statistics Division. Imports of affected steel articles to the US constituted $23.5 billion in 2016, which was nearly half of all US iron and steel imports in 2016 and about 1 percent of total US merchandise imports that year. US imports of aluminum articles constituted less at about $15 billion in 2016, or approximately 80 percent of total US aluminum imports. The winners and losers among US trading partners vary based on the specific articles. Steel articles. The top 5 exporters of steel articles to the US are Canada, the Republic of Korea, Mexico, Japan, and Brazil, however, article-by-article trade dynamics modify the impact of the tariffs. The largest categories of steel articles affected by the new tariffs are flat-rolled products, tubes, pipes, and hollow profiles of iron or non-alloy steel. Brazil is the largest exporter of semi-finished products of iron or non-alloy steel to the US. Aluminum articles. 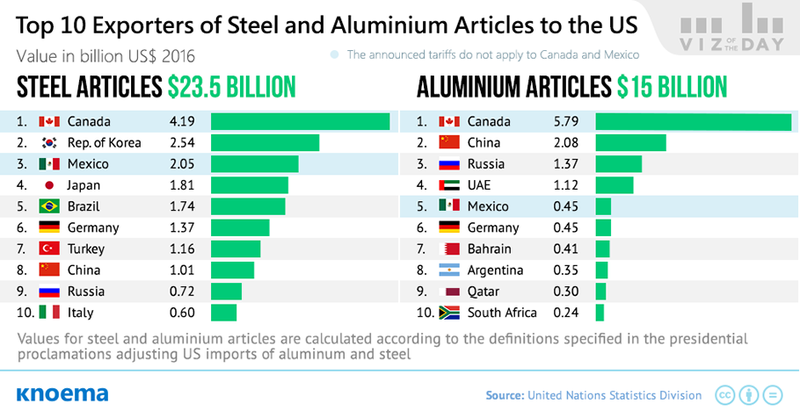 Canada is also among the top 5 exporters of aluminum articles to the US, joined by China, Russia, the UAE, and Mexico. The largest affected category among aluminum articles is unwrought aluminum. China is the largest exporter of aluminum plates, sheets, and strip to the US. View original infographics, live dashboard and download data at knoema.com.